Aphids are common tree pests that also attack shrubs and other garden plants. Senske ISA Certified arborists can remove any type of aphid or remove other types of tree pests as well. Count on us to employ professional tree service. Have you ever parked your car in the shade under a large, overhanging tree only to find when you return that the tree has dripped a sticky residue onto your car? Well, before you run off to your nearest hardware store to purchase a saw and cut the tree down, you should understand what the real culprit is: Aphids. Aphids are small, pear-shaped, soft-bodied insects that feed on plants through needle-shaped noses that pierce plant stems, leaves, and tender plant parts. Aphids feed on fluid within the plant, causing the leaves of some plants to curl, yellow and distort. In addition to damaging the appearance of plants, aphids can also transfer diseases from one plant to another. While a small number of aphids normally do not cause much damage to trees and plants, aphid control can be difficult because of their rate of reproduction. Each individual aphid can reproduce as many as 80 new insects in one week. Aphids also like to feed in groups, so if not controlled, they can take over a plant in short order and cause the sticky tree substance, referred to as “honeydew”, to build upon the underside of plants and trees until it drips onto your freshly washed car. Another reason why aphid control is so important is that they can spread rapidly. Even though most aphids are wingless, once a tree has become overpopulated by feeding aphids and the food source has been depleted, a generation of winged aphids will be produced, allowing them to migrate to another food source. The only thing worse than having aphids create a sticky mess of one of your favorite trees or plants is having them make a sticky mess out of two - or even your entire garden. As is the case with most infestations, early detection can be your best weapon. And an aphid infestation is no different. The most difficult aspect of aphid control is the fact that by the time you notice the damage, they have already taken control of a large part of the tree, and some might think it’s too late. Aphid control is really a matter of early detection and prevention. Aphids cause the most damage in warm weather, usually with outside temperatures between 65° and 80°, and when plants and/or shrubs are coming out of dormancy and starting their growing season. One sure-fire way to know that you are dealing with an aphid problem is the notable sticky material building up on the leaves, often referred to as “honeydew”. Ladybugs help with aphid control One crucial aspect of aphid control is knowing where to look. Aphids usually like to hang out on the underside of leaves, so it is important to make sure and turn leaves over to inspect them for signs of these intruders, including checking the newer growth on the plant. Another way of detecting aphids early is the appearance of their enemies, which include lady beetles and lacewings. While early detection is critical for aphid control, don't forget that the best defense is a great offense. There are some simple things that you can do to keep an aphid infestation from happening in the first place. Spraying your shrubs and plants with water can help to knock any existing aphids off the leaves. This is effective because they have a very hard time getting back up to damage the plants as most aphids do not have wings. While not a permanent fix, regular spraying can disrupt the aphids enough to prevent them from causing major damage. For large shrubs and trees, including those beautiful shade trees you park your car under to say cool, the most effective aphid control method is to perform preventative insecticide treatments that move through the tree systemically through what is referred to as systemic injections or tree injections. The injections are made of up special control materials that the trees absorb from the soil under their drip line and are transported by the sap all over the tree. The aphids then feed on the sap and ingest enough of the control material to stop them cold! Tree injections are perfectly safe and environmentally friendly, as the materials are not exposed to birds, pets or children at any time. For help with getting rid of these sticky intruders, contact us today at (877) 944-4007 or click to request a Free Estimate. Our lawn and tree care experts can help you park worry free. Aphids are shrub and tree pests that can kill your plants if left alone. As part of our comprehensive tree service, Senske is dedicated to removing tree and shrub pests such as aphids. Rose gardens can be a place of beauty, relaxation, and inspiration. There are not many things that can disrupt a garden’s beauty faster than aphids. Aphids are small, pear shaped insects that feed on the sap of growing plants. Individual aphids are not particularly dangerous to plants, but they reproduce at an alarming rate and can take over a garden in no time. Aphids also produce a sticky residue called “honeydew” that creates the perfect environment for black mold to develop. Aphids are especially a problem for rose lovers. 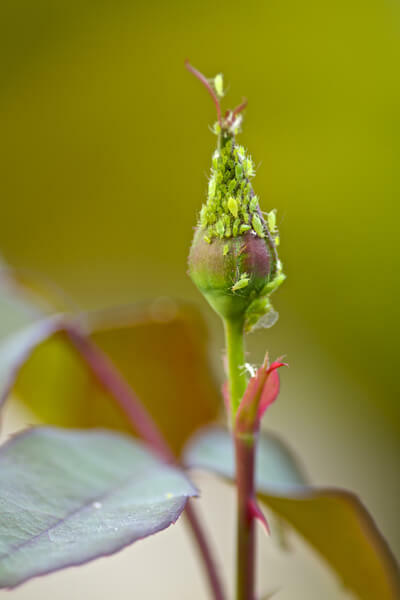 Because aphids like to feed on the sap of a plant during early growth, rose aphids will attach themselves to emerging rose buds. They will then feed on the buds as it they are developing, which can lead to stunted growth, or deformities in the rose buds. Since the insects are feeding on the plant while it is still growing, the effects of the attack during this important time can last far beyond the initial aphid infestation. Rose aphid infestations can also cause leaves and petals to prematurely fall from full bloom roses. Finding aphids before they start to spread is key for rose aphid control. Look for aphids on flower buds, shoot tips, and young foliage. Normally, aphids can be found on the underside of leaves. If aphids are found, spraying the rose bush with water can knock the aphids off, but just spraying aphids is not a permanent fix. However, you would have to repeat this tedious effort often, so a more effective solution is to hire a professional who can treat and control the rose aphid problem to alleviate any current and future issues. Don’t let these small pests infect and damage your roses. Contact us today at (877) 944-4007 or click for a Free Estimate.